1. Sanger Engineering's 1:72 vacform Mi-6 'Hook' #7219 is now available. As you might expect, the vacform sheet is rather large (60 x 24 cm. approx), and gives you the two fuselage halves, top engine cover (slightly assymetrical), fuel tanks, rotor blades, stabilisers, wings and main undercarriage struts. The rotor blades and struts are single pieces and therefore will be hollow on one side until you take some action to fill them in or otherwise re-model them. I would suggest that you will want to replace the struts with something more substantial and realistic anyway. The tanks, stabiliser and wing pieces are each formed in two halves and so will need less work. The tanks have been given a flat area for attachment to the fuselage that is completely unrealistic - you will want to replace these parts as well. The fuselage itself comes with circular depressions to be drilled out to create the round window openings, but there is one too many of these on the left side - following the incorrect drawing shown by Everett-Heath in the Jane's publication 'Soviet Helicopters - Design, Development and Tactics'. The provision for the window in the cockpit door on the same side is also round, although most aircraft have a square window in this position. The only panel lines are around the various doors so if you want any more you will have to scribe them yourself. The profile looks about right, the one obvious problem being that the tops of the engine compartments are about horizontal and parallel to the underside of the fuselage, whereas they ought to slope down more towards the nose - fixing this could be a problem. The fuselage length is pretty well spot on and the main rotor diameter seems about right. The two clear vacform canopy sections are entirely lacking in panel lines, but you may not necessarily see this as a shortcoming. The bag of white metal parts gives you main wheels (each in two halves), nose wheels, nose undercarriage strut, seats, rotor hubs, blade roots and pitch links, aerials, tail-skid, and engine intake rings. The assembly instructions also refer to fuel tank support struts and main undercarriage struts, but these seemed to be missing from my kit. I wrote to Sanger enquiring about these, and received (by return post) an envelope containing two pieces of plastic aerofoil-section strut (135 x 2 mm) and a letter explaining that these should have been included for the tank supports, but that the undercarriage struts were "moulded as four sections on the vac formed sheet". In actual fact there are only two pieces of u/c support on the vac sheet and, as I said above, you wouldn't want to use them anyway. 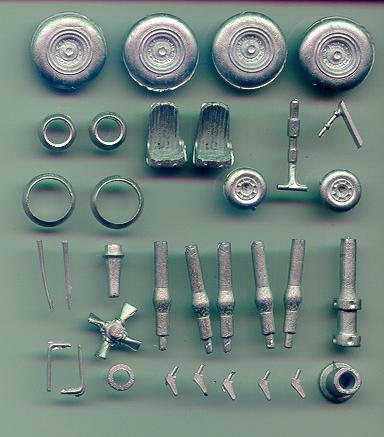 The white metal pieces are well moulded in my example. I know of one other person who has received this kit, he too was missing the tank support struts, and has one main wheel half incompletely moulded. It was suggested prior to release that decals would be provided but they are not. The instructions just show red stars in four positions and a serial number. No interior or exterior painting suggestions are given. Included with the written instructions are a set of 1:72 drawings which give you a general idea of how it fits together (and show you a marginally more accurate profile around the engine section). Comparison of this kit with the old Airmodel vacform #43 gives mixed results. Certainly the white metal parts are a big plus, and the provision or otherwise of panel lines is a matter of personal preference. Airmodel's windows weren't in the right places either, but their fuel tanks and the profile of the engine compartments were more accurate. Overall I think I would prefer to build the Sanger kit and make the necessary corrections, though I feel I could have got a bit more quality and detail for my money. 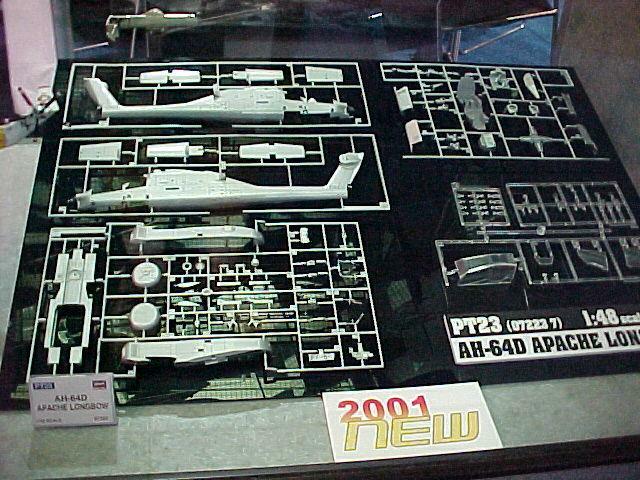 A word of warning to those of you who are hoping to skip this one and wait for the advertised Mi-10 and Mi-26 kits. This is the first helicopter kit that Sanger have produced and they are unsure about how the sales will go - Hannants have told them that helicopter kits don't sell very well. I quote from one of Sanger's letters: "As I said on the phone to you ... if there is sufficient interest we may introduce some alterations to this initial kit and will release both versions of the Mi-10 and Mi-26 Halo". You may think this sounds a bit like modelling blackmail but I suppose it makes commercial sense! 2. For Mi-6 (and other Russian helicopter) cockpit details, take a look at Real Cockpits. 3. There are also some nice Halo walkaround pictures at Burkhard Domke's admirable Aviation Images. #4466, 1:48 SH-3H Sea King, US Navy (believed to be rebox of the Hasegawa plastic). Includes optional folded main rotor, sonar buoys and MAD, torpedoes & winch. #4474, 1:32 EC135 'HeliCops'. The 'old' EC135 kit with a large selection of new parts and new markings, to model the fictional machine which appears in the German Sat.1 TV series 'HeliCops - Einsatz Uber Berlin'. #27003, 1:72 KV-107II-4 Shirasagi "JASDF"
#27029, 1:72 HSS-2B Seaking "JMSDF"
#72072, 1:72 SH-3H Seaking "United States Navy"
#72073, 1:72 Westland Seaking "Flying Tigers"
7. Academy have re-issued #1644, their 1:48 Hughes 500D TOW. 8. Also from Academy (ex MRC) comes #2201, the USAF HH-60H Pave Hawk version of their recent (and by all accounts slightly disappointing) 1:35 Blackhawk. According to Squadron this comes with "detailed engine & rotor assemblies, full cockpit & cabin interiors, and in-flight refueling probe. It can be built as an unarmed SAR aircraft or as a fully armed Combat SAR/Special Operations aircraft with door & window mounted MGs and miniguns." 9. To go with the Blackhawk & Pave Hawk kits, Squadron are offering accessory set #3553 from Dynasty/Coree of Korea, a UH-60 Helicopter Crew. This comprises two modern US resin figures; one helmeted male with M16 carbine, and one female wearing a cavalry hat. 10. Landing Zone have released #48101, a 1:48 MH-53J Pave Low III resin conversion set for the old Revell H-53 kits. This includes "nose, pylons, ECM/RHAW, chaff & flare dispensers, etc." and is available from Hannants. Note that Cobra Company, well known for their excellent quality, already have an equivalent set available, #48-024 (see HKN #110). I am assuming this is different. 12. 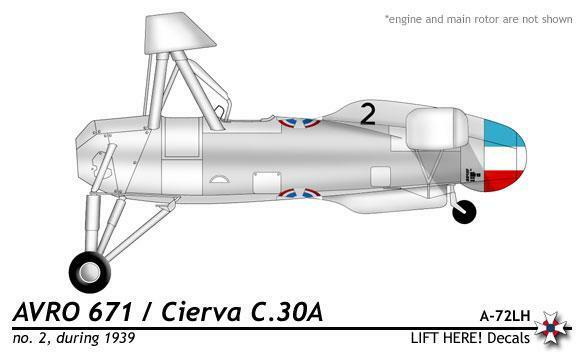 The Serbian / Yugoslavian modelling website Maketorama seems to have published a set of 1:72 decals, #A-72LH, for the two Cierva C.30A's (c/n 1029 & 1030) that were operated by the Yugoslavian Air Force. I'm hoping to get more information about these. 13. The Mi-8 book mentioned in HKN #129 turns out to be available in both English and Russian editions. The English version is entitled "Mi-8 40 years and Still Going Strong". The author is Vadim Mikheyev, publisher is Polygon-Press, ISBN is 5-94384-007-9. There are lots of nice pictures and some interesting history (from the Mil archives) that I haven't read anywhere before, but I did get rather confused by the way the text seems to jump about from one version to another, and by the fact that the designations do not always seem to be the same as those commonly published in the 'west'. Further study required on my part, I suspect. Thanks to Yevgeny Borissov, David Nilsson, Tony Morgan, and Petr Zaoral.